The East-West Center has announced the names of EWC alumni that will be honored with the Outstanding Volunteer Award at the Center’s upcoming international alumni conference in Okinawa. This award recognizes outstanding alumni volunteers who have provided significant contributions to the programs and activities of the East-West Center Association and recognizes their selfless service. The awardees lead by example, demonstrating the qualities that bring out the best in others. 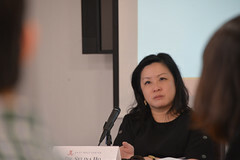 Sumi Makey is well-known to many EWC alumni from her years as the Center’s Dean of Students and Open Grants. Since her retirement from the Center, she has served as a volunteer in numerous committees and has worked tirelessly to help raise funds to ensure the Center’s future. She is a vital member of the EWCA Endowment Committee and has also established a scholarship in her name to benefit Center degree fellows. Bob Nakasone is recognized for his many years of volunteer support in building links between the EWC and the Okinawa community. He is a founding member of the Worldwide Uchinanchu Business Association (WUB) and helped create the Obuchi Okinawa Education and Research Program which promotes scholarships, faculty/research exchanges, and business seminars and internships between Okinawa and the U.S. 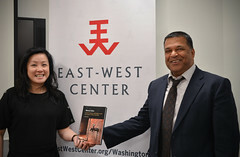 The program, supported jointly by the East-West Center and the Japan Foundation, serves as an important link between Okinawa and the United States and as a means to help advance Okinawa’s future. Most recently he has been providing volunteer support as a valued adviser in preparation for the EWC/EWCA International Conference in Okinawa. Larry Smith has provided outstanding service and support to the Center by contributing to the development of educational programs for EWC students. He has served as an active member of the Friends of the EWC, including two years as its president, and is currently the co-chair of the EWCA Endowment Committee, which raises funds for student scholarships as a legacy to help future generations of students share the EWC experience. 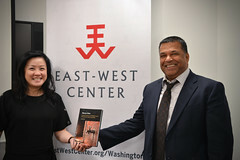 The conference is jointly presented by the East-West Center, an internationally recognized education and research institution headquartered in Honolulu, Hawaii, and the East-West Center Association, the organization that represents the Center’s more than 62,000 alumni throughout Asia, the Pacific and the U.S., many of whom now serve in positions of responsibility in their respective fields.